Typed manuscript versions of the papers whose titles are in blue can be obtained by clicking on the relevant link. I no longer have manuscript versions of the older papers whose titles are in black, so cannot post them online. However, I do have PDF copies of the published versions of all these papers and will send them to interested readers on request. Request a paper here. Alexander, D. Boone, C. & Lynn, M. The effects of tip recommendations on Customer tipping, satisfaction, re-patronage, and spending. Unpublished manuscript, Cornell University. Lynn, M. (forthcoming). The effects of tipping on consumers' satisfaction with restaurants. Journal of Consumer Affairs. Lynn, M. & Brewster, Z. (2018). A within-restaurant analysis of changes in customer satisfaction following the introduction of service inclusive pricing or automatic service charges. International Journal of Hospitality Management, 70, 9-15. Lynn,M. (2018). Are published techniques for increasing service gratuities/tips effective? ​​ ​​International Journal of Hospitality Management, 69, 65-74. Wang, S. & Lynn, M. (2017). The effects of service charges versus service-included pricing on deal perception. Journal of Hospitality & Tourism Research, 41(2), 246-254. ​of the issues and evidence. Psychosociological Issues in Human Resource Management, 5(1), 120-159. Lynn, M. (2016). 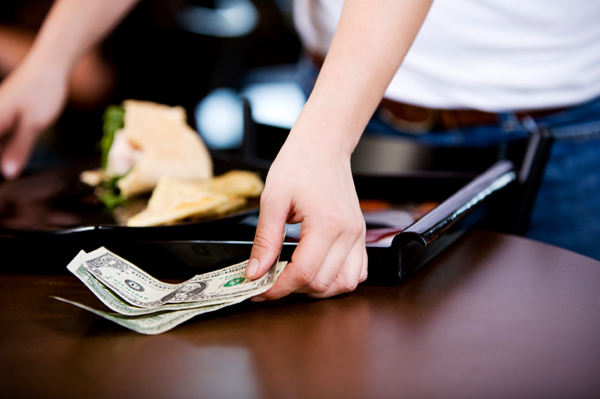 Motivations for tipping: How they differ across more and less frequently tipped services. Journal of Behavioral and Experimental Economics, 65, 38-48. ​ Lynn, M., Giebelhausen, M. Garcia, S., Li, Y. & Patumanon, I. (2016). Clothing color and tipping: An attempted replication and extension. Journal of Hospitality & Tourism Research, 40(4), 516-524. Lynn, M. (2016). Why are we more likely to tip some service occupations than others? Theory, evidence and implications. Journal of Economic Psychology, 54, 134-150. Lynn, M. & Kwortnik, R.J. (2015). The effects of tipping policies on customer satisfaction: A test from the cruise industry. International Journal of Hospitality Management, 51, 15-18. Lynn, M. & Starbuck, M. (2015). National differences in in tipping customs: The effects of national attitudes toward tipping and sensitivities to duty and social pressure. Journal of Behavioral and Experimental Economics, 57, 158-166. Brewster, Z., Brauer, J.R. & Lynn, M. (2015). Economic motivations and moral controls regulating discrimination against black and Hispanic diners. The Sociological Quarterly, 56 (3), 506-538. ​Lynn, M. (2015). Negative perceptions of Christian tippers: How widespread are they? Journal of Foodservice Business Research, 18 (2), 163-170. Lynn, M. (2015). Explanations for service gratuities and tipping: Evidence from individual differences in tipping motivations and tendencies. Journal of Behavioral and Experimental Economics, 55, 65-71. Lynn, M. (2015). Service gratuities and tipping: A motivational framework. Journal of Economic Psychology, 46, 74-88. Lynn, M. & Brewster, Z. (2015). Racial and ethnic differences in tipping: The role of perceived descriptive and injunctive tipping norms. Cornell Hospitality Quarterly, 56 (1), 68-79. Brewster, Z. & Lynn, M. (2014). Black-White earnings gap among restaurant servers: A replication, extension, and exploration of consumer racial discrimination in tipping. Sociological Inquiry, 84(4), 545-569. Lynn, M. (2014). The contribution of norm familiarity to race differences in tipping: A replication and extension. Journal of Hospitality & Tourism Research, 38(3), 414-425. ​​Lynn, M. & Wang, S. (2013). The indirect effects of tipping policies on patronage intentions through perceived expensiveness, fairness and quality. Journal of Economic Psychology, 39, 62-71. Lynn, M., Flynn, S.M. & Helion​​, C. (2013). Do consumers prefer round prices? Evidence from pay-what-you-want decisions and self-pumped gasoline purchases. Journal of Ecomic Psychology, 36, 96-102. ​Lynn, M. & Katz, B. (2013). Are chrisitian/religious people poor tippers? Journal of Applied Social Psychology, 43, 928-935. Lynn, M. (2013). A comparison of Asians', Hispanics' and Whites' restaurant tipping. Journal of Applied Social Psychology, 43, 834-839. Lynn, M., Pugh, C.C. & Williams, J. (2012). Black-White differences in tipping: Moderated by socio-economic status? Cornell Hospitality Quarterly, 53 (4), 286-294..
Lynn, M. & Williams, J. (2012).Black-White differences in beliefs about the U.S. restaurant tipping norm: Moderated by socio-economic status? International Journal of Hospitality Management, 31, 1033-1035. Lynn, M., Jabbour, P. & Kim, W.G. (2012). Who uses tips as a reward for service and when? An examination of potential moderators of the service-tipping relationship. Journal of Economic Psychology, 33, 90 - 103. Lynn, M., Kwortnik, R. & Sturman, M. (2011). Voluntary tipping and the selective attraction and retention of service workers in the United States: An application of the ASA Model. International Journal of Human Resources Management, 22 (9), 1887-1901. Lynn, M. (2011). Race differences in tipping: Testing the role of norm familiarity. Cornell Hospitality Quarterly, 52 (1), 73-80. Lynn, M. & Sturman, M.C. (2010). Tipping and service quality: A within-subjects analysis. Journal of Hospitality and Tourism, 34 (2), 269-275. Saunders, S.G. & Lynn, M. (2010). Why tip? An empirical test of motivations for tipping car guards. Journal of Economic Psychology, 31 (1), 106-113. Lynn, M. & McCall, M. (2009). Techniques for increasing tips: How generalizable are they? Cornell Hospitality Quarterly, 50, 198-208. Lynn, M. (2009). Individual differences in self-attributed motives for tipping: Antecedents, consequences, and implications. International Journal of Hospitality Management, 28, 432-438. Kwortnik, R.J., Lynn, M. & Ross, W.T. (2009). Buyer monitoring: A means to insure personalized service. Journal of Marketing Research, XLVI, 573-583. Lynn, M. (2009). Determinants and consequences of female attractiveness and sexiness: Realistic tests with restaurant waitresses. Archives of Sexual Behavior, 38, 737-745. Lynn, M. & Withiam, G. (2008). Tipping and its alternatives: Business considerations and directions for research. Journal of Services Marketing, 22 (4), 328-336. Lynn, M., et. al. (2008). Consumer racial discrimination in tipping: A replication and extension. Journal of Applied Social Psychology, 38, 1045-1060. Lynn, M. (2008). Personality effects on tipping attitudes, self-reported behaviors and customs: A multi-level inquiry. Personality and Individual Differences, 44, 989-999.